There’s no shortage of remasters and remakes these days, especially on the PlayStation 4. With that in mind, some of you may still be on the fence when it comes to whether or not you want to glide into the Spyro Reignited Trilogy. If that’s the case, this forty-five minute gameplay video, featuring one level from each of the three games, just might spark that flame. Check out this Spyro Reignited Trilogy footage. Rob Pearson and David Jackson, from PlayStation Access, teamed up to take on Stone Hill, Idol Springs, and Sunny Villa from Spyro the Dragon, Spyro 2: Ripto’s Rage!, and Spyro: Year of the Dragon, respectively. Jackson, who has never played Spyro before, took control, while Pearson provided context for what was happening on screen and guided Jackson through the levels. While Jackson’s novice Spyro skills created tension on screen, they also offered great insight for newcomers who can’t turn to this collection simply for nostalgia. The gameplay is what you’d expect, as Jackson flamed his way through herds of sheep, glided to collect gems, opened treasure chests, swam, and even took on some puzzles (which proved to be surprisingly difficult). Spyro Reignited Trilogy looked beautiful in the footage. Some key changes helped bring these games to life in the modern era, most notably the lively animations and how each dragon Spyro rescues has their own unique personality. 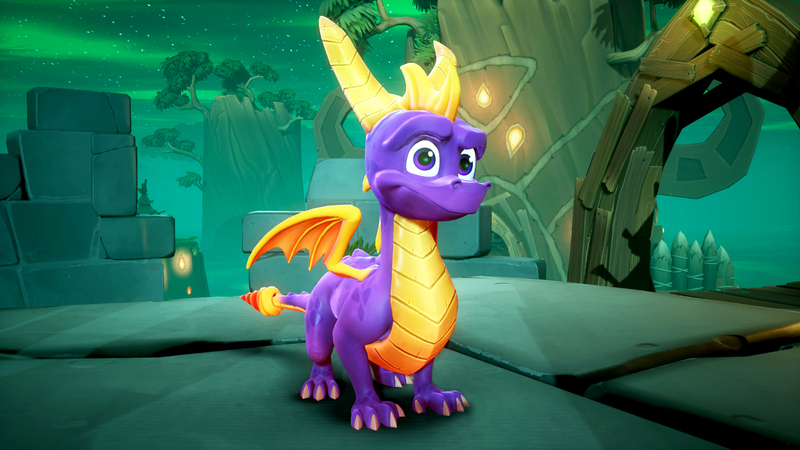 Pearson took the time to point out that unlike the Crash Bandicoot: N.Sane Trilogy, which is known for its difficult platforming, the Spyro Reignited Trilogy is far more open in its level design and death is far less frequent. For more on gameplay commentary, be sure to check out our hands-on preview. Spyro Reignited Trilogy is set to release on September 21, 2018 for the PlayStation 4 and Xbox One.